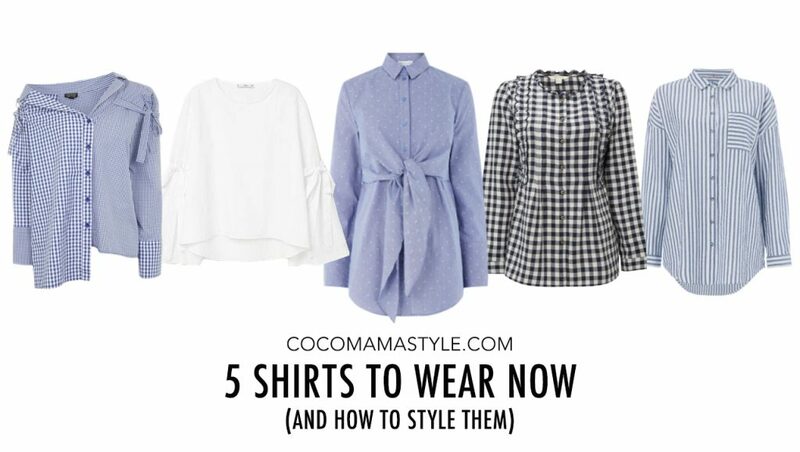 Sorry, T-shirts, it’s time to step aside as The Shirt is making waves in our wardrobes and it’s not the basic button-down used for layering that it once was; The Shirt is now a ‘feature top’ in its own right. 5 key shirt types are strong this season with reworked shapes, classic and updated prints and deconstruction – there’s a shirt to update every outfit. Here’s your new season shirt breakdown with ideas for styling each. 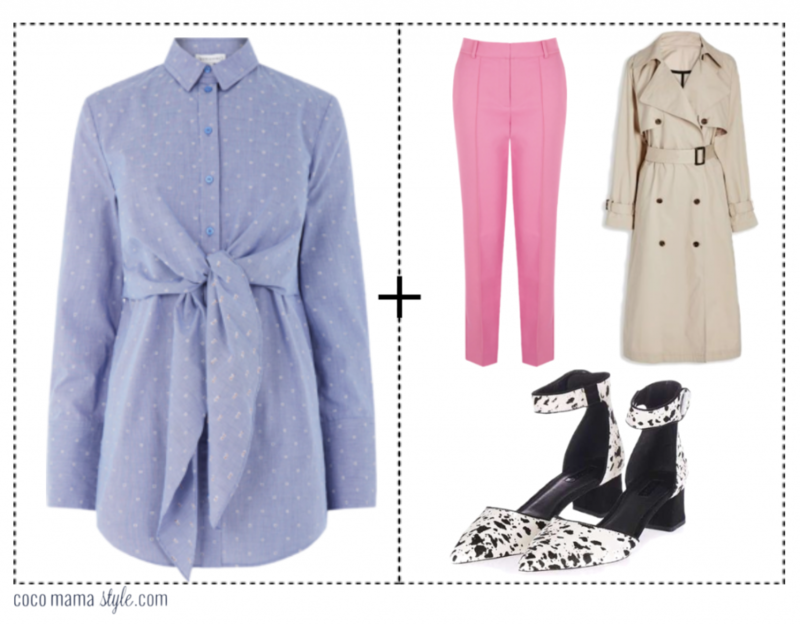 Remember, check your wardrobe for similar items to pair with your new statement shirt before shopping the extras! Give tailoring a new lease of life with a tie waist shirt and introduce the colour of the season – pink – to give the look an on-trend summer feel. Complete the look with a lightweight oversized trench coat this particular one was seen (also in blue) on the streets of London during Fashion Week. Update your skinny jeans for the new season with a cut and paste shirt; the more detail the better as deconstructed and patched shirts have been easing their way onto the High Street for a couple of seasons now. If a slight crop or off the shoulder shape feels like you may flash a little more than you’d like, wear with high waist jeans to hide your tum and layer with a bright vest beneath. Silver flats update your practical shoe game for the new season. Gingham is one of the strong prints of the season but the key is to wear it like a grown-up; avoid little checked dresses unless you want to rock that school girl vibe. 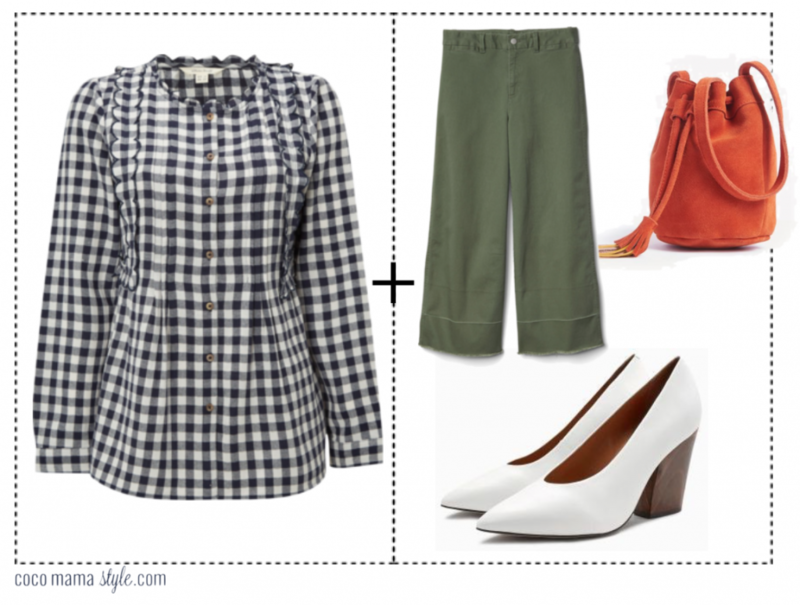 Instead look for gingham shirts, shorts or trousers. We’re seeing a lot of gingham made up in ruffles and peasant style tops so why not bring this classic picnic pattern into shirt world too. 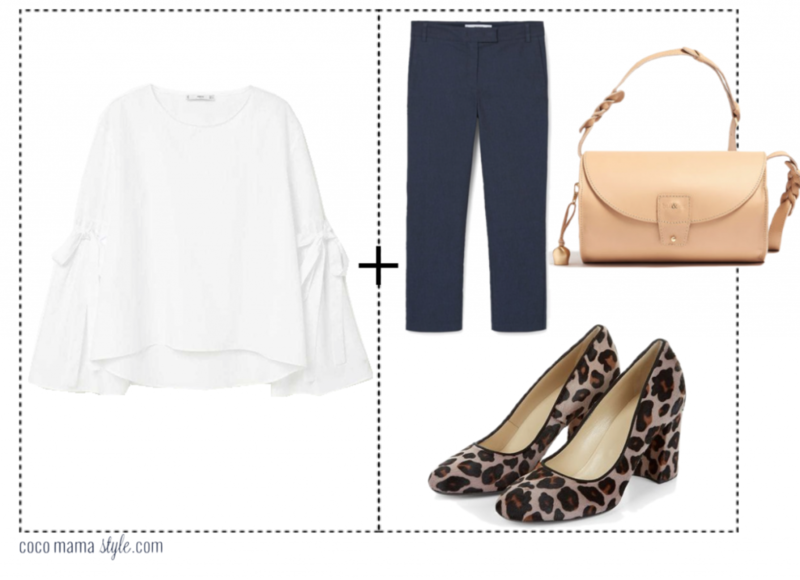 Add a nipped-in waist and some scallop detailing and this blouse will take you from school run to park to work. To give this shirt an edge, pair with wide leg cropped trousers, balanced with a chunky heeled shoe – white heels are hot for summer but think thick-heeled, not stiletto. A tangerine bag will complement the other tones within the outfit and the bucket shape gives a more casual twist. Yes, a shirt with sleeves may seem pretty much a given, admittedly, but this season one of the key updates is to focus on the sleeves. Long cuffs, added volume, flared or tied; make sleeves the statement in your outfit. In a crisp white shirt with a bold sleeve, keep the rest of the outfit classic with navy trousers (or jeans), leopard shoes and a neutral bag in a current shape – the barrel bag is a great update. Pyjama stripes were big on the catwalks for SS17 (as were pinstripes) and this more classic feel to the shirt lends itself well to down-time dressing to add a smarter edge to a relaxed jeans and trainers outfit. 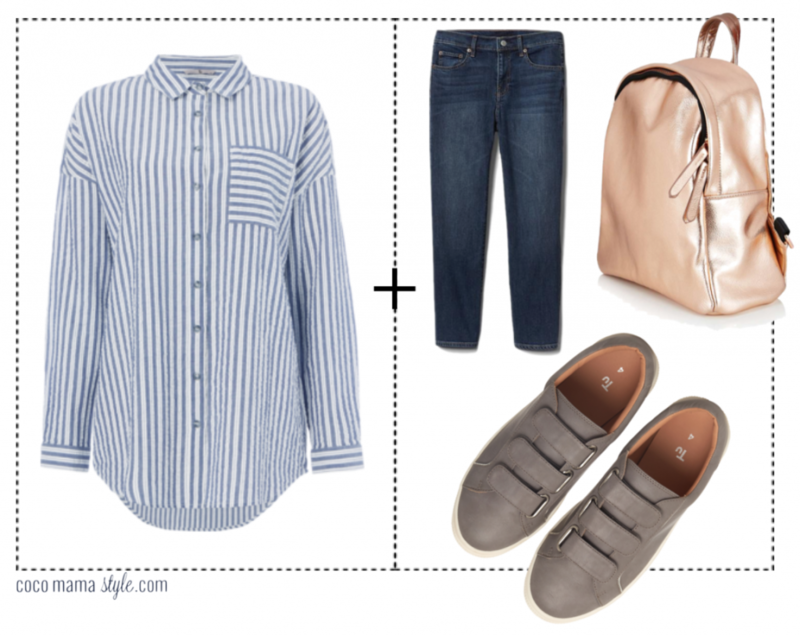 Dark denim works well next to a light blue and white striped shirt and neutral trainers keep it simple but add some interest with a bright jacket or metallic bag. Casual outfits needn’t be dull.